The consortium comprising ENGIE Fabricom, Smulders and CG was contracted in December 2015 to design, supply and install the offshore substation for EnBW Energie Baden-Württemberg (EnBW). 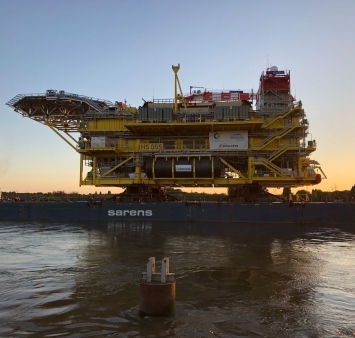 Yesterday evening the substation set sail towards its destination, approximately 98km off the German coast and 90km north of Borkum island in the North Sea. With its 55 metres length and 30 metres height, its 4,500 tonnes, 3 transformers and 3 shunt reactors, Hohe See is the biggest substation ever built on the ENGIE Fabricom Hoboken yard. 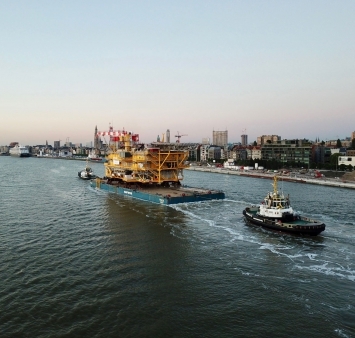 The substation will be installed on the jacket foundation built by Smulders on their site in Vlissingen in the Netherlands which was transported to its final location in the German North Sea on 29 May. CG is in charge of the high/medium voltage equipment. The Hohe See wind farm is situated in the North Sea, 98 km off the German coast. It consists of 71 turbines with 7MW capacity each. It is expected to generate approximately two billion kilowatt-hours of renewable electricity a year, which will be sufficient to power 560,000 homes and will offset 1.5 million tonnes of CO2 emissions a year. For the construction of the substation, ENGIE Fabricom was responsible for the engineering, procurement, construction and commissioning of the offshore substation’s topside and the low-voltage installations and the offshore transport and offshore installation using the Thialf lifting vessel (capacity 14.200T). Smulders was in charge of the steel construction of the topside and jackets. CG was responsible for the design, manufacturing, installation and commissioning of the high/medium-voltage equipment, and control and protection systems for the platform. The substation will be shipped directly from Hoboken to its final destination. The journey with the Thialf lifting vessel, the largest installation vessel, will take approximately 3 days, depending on the wheather conditions. The installation will be done in the coming week.